Donations to the St Anthony Shrine enable the Franciscan Friars to be effective ministers of the Gospel. Your gift today helps us to continue to serve the poor and needy as well as our men in formation, and our retired and infirm friars. Donate to the Franciscans today! 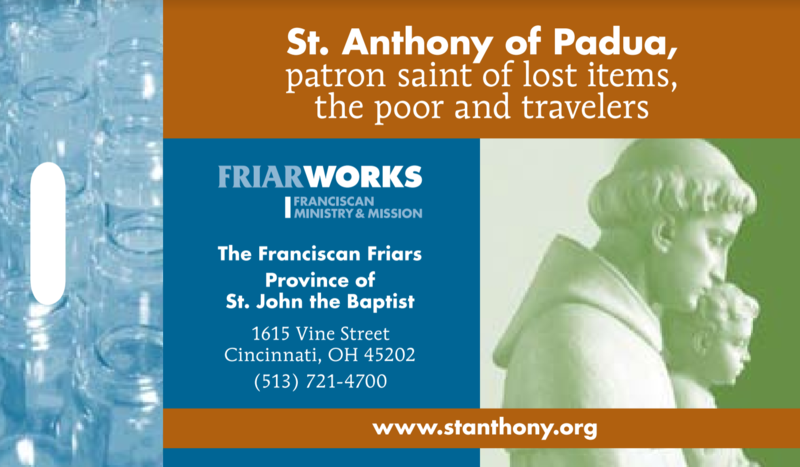 Gifts of $35 or more are eligible to receive this complimentary St. Anthony luggage tag. If you would like make your donation by phone, please call us at 513-721-4700. For monetary donations, please select whether you want to make a recurring or one-time donation. (Please do not use decimals) $5 minimum donation. Comments including gift preference, memorials, tributes, etc. How Did St. Anthony Help You Find Us? Please do not add me to your regular mail list. I prefer on line only.